Visit our flooring center that makes you the priority. When you bring in your design plan, our team can start to identify smart solutions that are capable of making your project a success. The Flooring Pros, Inc. is your source for creative design assistance and advanced luxury vinyl flooring in Charlotte, NC. We consider the entire home when we identify a series of flooring options that fit your vision and your approach to life. While laminate flooring works well in high-traffic areas of your home, vinyl is a smarter way to go for any rooms that experience higher levels of moisture. We carry a broad selection of vinyl tiles and planks that feature a photo wear layer that gives the appearance of traditional hardwood, slate, and stone. Transform your ordinary kitchen into your favorite room in the home when you combine the character of natural wood and the durability of vinyl into one innovative product. We carry vinyl products from many of the leading names you have come to trust. Review our 5-Star Selection System and see how it helps you find the products and protections you need for every room in your home. Creating a design plan for a living space with active kids and pets on the go can be challenging for any flooring professional. Identifying a product that provides the customer with both functionality and appeal can make a big difference when it comes to their overall satisfaction. Our extensive selection can leave many customers feeling overwhelmed, so we provide you with the support you need, at every step of your process. Many feel as though they have to sacrifice style for performance when it comes to flooring for the kitchen and bathroom. Luxury vinyl in the hands of an experienced installation specialist provides you with the performance you need and the style you deserve. When you choose an installation specialist with the right tools for the job, you are sure to get the most value for your flooring investment. 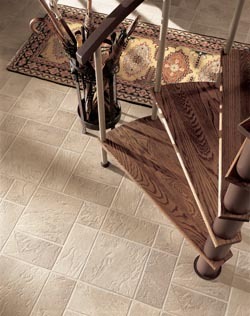 Luxury vinyl tile is resistant to fading and performs well with spills. When a vinyl floor is sealed correctly, it is easier to clean. That barrier protects the subfloor and helps you to avoid a mold or mildew infestation. Choose a luxury vinyl plank product that is designed to endure the traffic you expect, and make the installation process that much easier. Before you decide to put your home on the market for sale, see what a difference new flooring can make. Your location can become a destination with the right choice of value-added flooring. Contact us at our store today and get the luxury vinyl flooring you need for a modern home. We proudly serve customers in Charlotte, Matthews, Pineville, Sun City, Waxhaw, North Carolina, and the surrounding communities.